Rithika Merchant (b. 1986) received her Bachelor’s Degree in Fine Arts from Parsons - The New School of Design, New York (2008). Since graduating, she has exhibited her work extensively, including a number of solo exhibitions in India, Spain, Germany, and the United States. 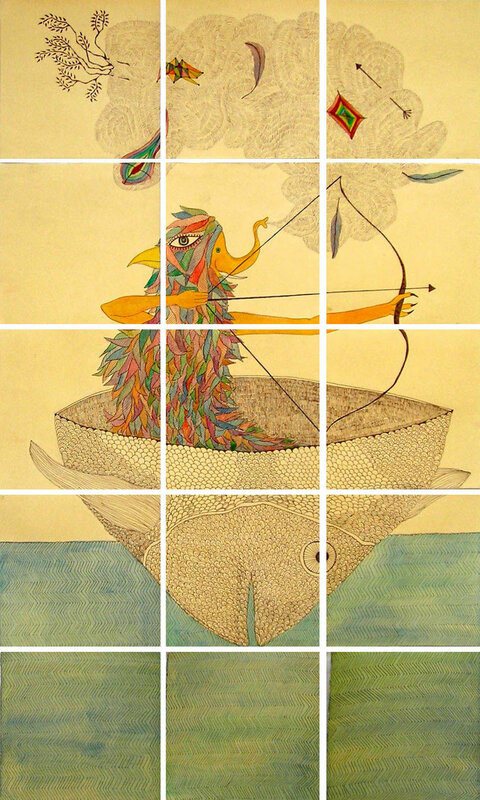 Merchant's works are an exploration of epics and myths across geography. 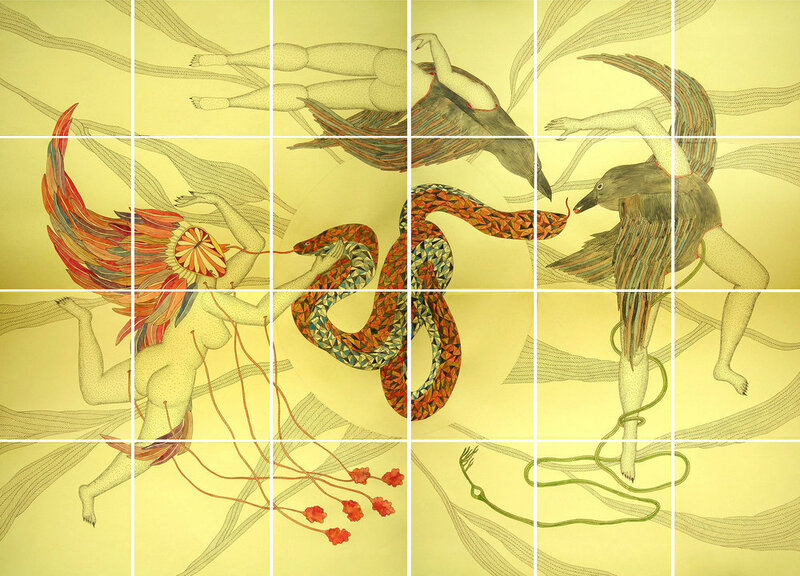 She create mosaics of myths that question received histories that are available to us throughout culture. Derived from an attempt at self discovery and aimed towards solving contemporary strife; created by what we may describe as a conflict of civilizations, which is negated by locating a mythical strain of unanimity. Merchant is keen to explore the common thread that runs through different cultures and religions. 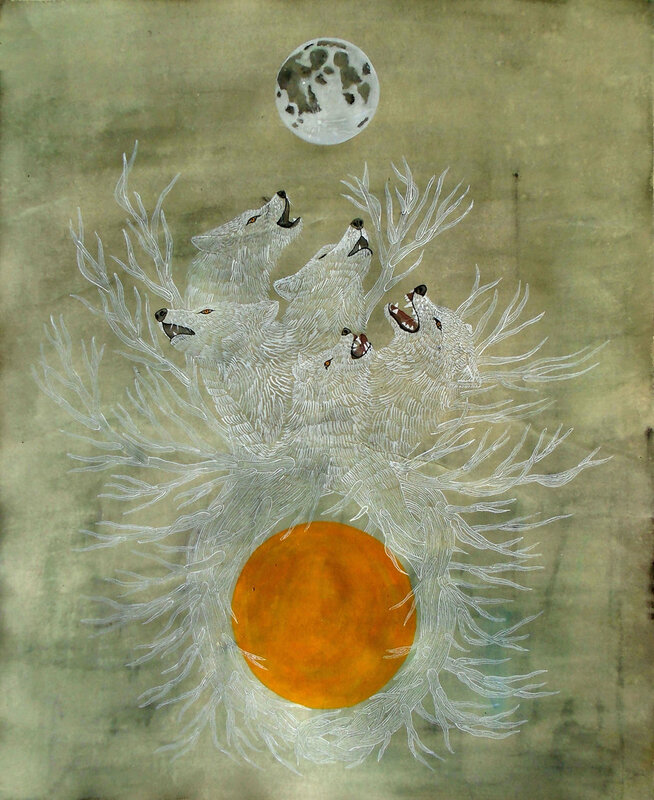 Similar myths, stories and ideas are shared by cultures all around the world, her paintings explore this concept while also featuring creatures and symbolism that are part of my personal visual vocabulary. Each piece can be seen as a totem that invites the viewer to stitch together their own narrative, drawing on collective memories and signifiers to generate meanings, Merchant further explores how objects can be markers of identity and how these may be reworked in contemporary contexts as meanings and interpretations change. Nature plays a pivotal role her work and is emphasised by the use of organic shapes and non saturated colours. Merchant's paintings are made using a combination of watercolour and collage elements, drawing on 17th century botanical drawings and folk art, to create a body of work that is visually linked to our collective pasts. Tell us a little about your background as an artist. Where are you based now and how would you describe what you do? I was born and raised in Bombay, India. I graduated with a BFA in Fine Art from Parson The New School For Design in New York. I currently divide my time as much as I can between Bombay and Barcelona. I have always been very interested in narratives, myths and received histories that are available to us. I am also interested in how these different fragments are “woven” together to from a complete image. Most cultures use imagery to tell stories and represent ideas. I try to use these ancient means of storytelling in a more contemporary context. I would describe my style as semi surreal, intricately detailed, visual storytelling. Lots of desaturated colour, inspired by and in vein of old maps, and botanical drawings. Describe the technical process you use to create your work. I create primarily in my studio in Barcelona, Spain. My studio is part of my home and I love being able to wake up and walk down the corridor to another room and start creating. I spend a lot of my time reading and researching ideas I have, or subjects that I am interested in. I will often read something and have a very vivid image in my mind. Sometimes it’s just a flash, and manifesting these ideas comes naturally. I have my own lexicon of symbols and creatures that I use in my work and so I use these as tools to help me as I visualise these ideas. Once I have a clear idea or image in my head I usually just start to draw directly onto my paper - I rarely sketch beforehand - then I add ink and paint. Sometimes I may do a colour wash or tint on the paper before I begin. If I am working on a folded piece, then I will fold the paper or make some cuts before I start drawing. I also have a notebook in which I make lots of written notes and diagrams but I almost never make sketches or studies of things. I sketch more with words than images. For my folded pieces, I usually fold the paper before I begin drawing and then after I finish the painting I fold it back up along the same creases to store it. Often, I am able to fold it into some sort of smaller geometric shape, and the paintings then turns into an object. In this way, the paper itself is part of the narrative. Would you describe yourself as an environmental artist? What is the relationship between your work and nature? I would not necessarily describe myself as an environmental artists. However I am interested in he connection that humans have with nature. Collectively we have always tried to look for analogy and relationships within nature, be it in shapes, purpose, and power. Would you say that your art is purpose-driven? If so, what do you aim to accomplish through your creative expression? What do you hope you art communicates to those who come into contact with it? Much of my work is a response to what is going on in the world around us - the mass displacement of people, forced migration, and the dislocation and exile of many groups of people all over the world are very troubling to me. Living in Barcelona I have felt very helpless watching the European refugee crisis unfold right on my doorstep. My most recent show “Where The Water Takes Us” deals with the profound effect this has had on me. I hope that through my work the audience is able to have empathy and awareness about what is going on in the world today. Which environmental issues and causes are you most passionate about? The preservation of specific and local ecosystems which are being ravaged. Such ecosystems have an important impact on the environment. Mangroves for example have the ability to recycle human waste and so it’s preservation would not only help save it’s biodiversity, it also directly beneficial to to us as well. Do you have any upcoming projects or exhibitions that you’d like to share with us? At the moment I am working on a few commissioned pieces. I am also taking the time to reflect and figure out what I want to work on next, as I am slowly preparing for an exhibition in Paris next year. Currently, I am part of an exhibition at the October Gallery in London.